Inspired by Chelsea in Bloom! Last week Chelsea was in full bloom! Alongside the RHS Chelsea Flower Show were the annual local displays of floral creations from Chelsea retailers who compete for a winning display. We’re very lucky that our Chelsea location means we were surrounded by beauty last week. We loved these displayed by Hackett and Links below. This year’s theme was ‘Carnival’ inspired by the Rio de Janeiro Carnival and Hackett embraced tropical flowers and colours, while Links opted to fly the British flag. 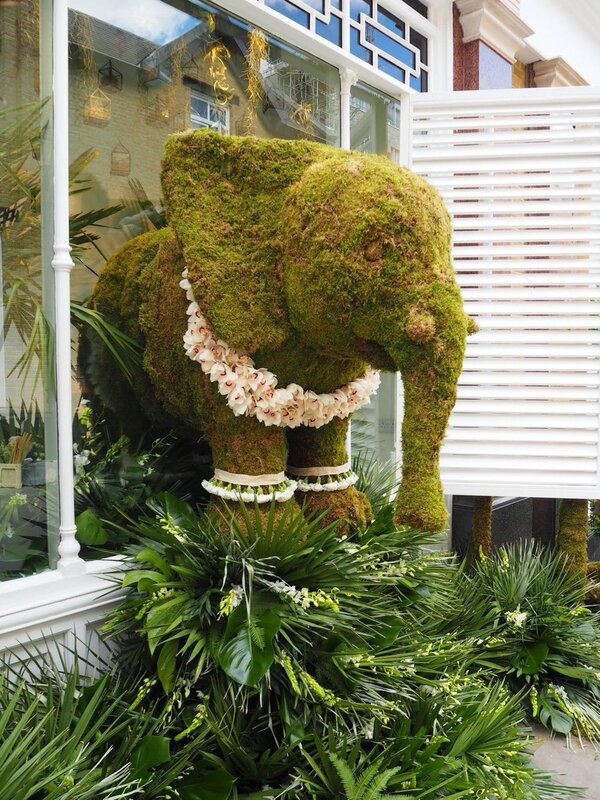 The White Company's window was our favourite, it's elephant creation was made by Larry Walshe and reminded us of the sculptures of Ganesh we've seen on our travels to India. If you’ve been inspired by these floral sculptures and creations popping up around Chelsea, there are more permanent ways of integrating floral features in to your home. Looking at the floral windows reminded us of de Gournay’s wallpapers. De Gournay specialise in hand painted wallpaper, fabrics, furniture and porcelain. Their wallpapers are based on 18th century Chinoiserie designs and always incorporate stunning floral designs. Fancy a beautiful flower display without the hassle of watering? We also love these faux flowers from Oka which look remarkably realistic, they also mean you aren't guided by the season and can chose exotic displays all year round. Oka recommend starting each arrangement with three flowers, building up by three each time until your display looks full enough. For a more realistic display chose a variety of sizes and shapes; include full flowers with an abundance of petals as well as greenery and branches like the display below on the right. We've said it before, but we stand by the simple fact that changing cushions, linen, throws and small accessories is the easiest way to quickly transform a room. If you're looking for some temporary colour and pattern we love these floral-inspired cushions from bluebellgray. We love their signature painterly style and each cushion is painted and sewn by hand in bluebellgray's Glasgow studio, making them truly unique.